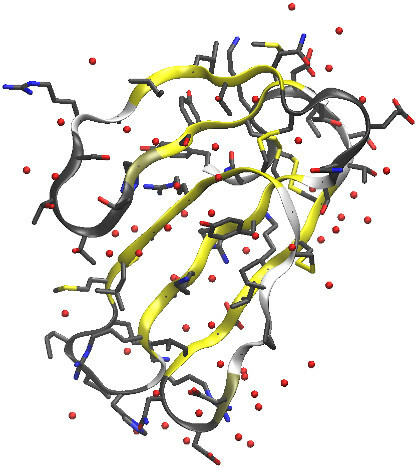 The LEaP program is a portal between many chemical structure file types (.pdb and .mol2, primarily), and the Amber model parameter file types such as .lib, .prepi, parm.dat, and .frcmod). Each of the parameter files contains pieces of information needed for constructing a simulation, whether for energy minimization or molecular dynamics. 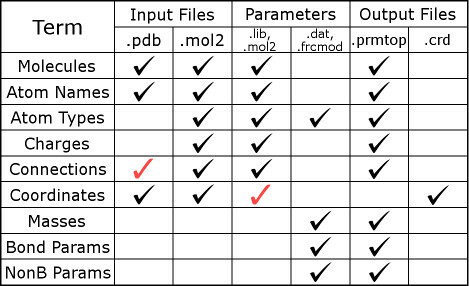 Given a complete set of parameters (the molecular model, which we call a "force field"), LEaP will generate an AMBER topology file (generally, the file extension is ".prmtop", although ".parm7" and ".top" are synonymous for the same file type) and coordinate file (appropriate file extensions for the products of LEaP include ".inpcrd" and ".crd"). LEaP functions within a larger workflow described in Section 1.1 of the Amber Manual. The figure below illustrates the information contained in different file types. A black checkmark in the figure indicates that such files are relevant to LEaP. A red checkmark in the figure indicates the file contains additional information that may not be relevant to LEaP. More detailed information about the contents of some files and their formats can be found on the AMBER file formats webpage, and in Section 14.1 of the AMBER 2016 Manual. Here we also have a figure for modeling files in CHARMM and GROMACS. The LeAP program collates parameters in order to make a complete description of a molecule. To see this in action, just read through one of the leaprc files in $AMBERHOME/dat/leap/cmd/. Each of them is read as a script: there are declarations of atom types and residues, as well as calls to load files containing parameters and residue definitions. For instance, our recommended protein force field is encoded in leaprc.protein.ff14SB, a file you'll be calling often. In that leaprc, you will find a call to load parm10.dat (a "full" force field parameter file) as well as frcmod.ff14SB (an auxiliary parameter file which has FORce field MODifications). In this case, frcmod.ff14SB supplements parm10.dat, but since it is specified later any conflicts will favor the frcmod. An alternative, equally modern protein force field can be found in leaprc.protein.ff15ipq, and this file calls only the main parameter file because all of its parameters were derived at the same time. In all leaprc files, there must also be libraries (lib files). It's one thing to have parameters, but it won't be of much help until the units of our molecule are clearly defined in terms of those parameters. As is indicated in the precedning chart, the residue libraries contain some of their own parameters: the charges. It may seem like an odd division of the material, but it owes to the way the Amber force fields work. There are alternative paradigms for defining a force field, which are well beyond the scope of this tutorial, but in short applying them would require a different program. Once LEaP knows all of the parameters, it tries to completely define all aspects of a structure it has been given. There is some degree of fault tolerance: LEaP can be presented with incomplete residues, or requests to simply build residues, and it will comply so long as it knows what the residues are made of. However, if LEaP does not know what a residue is, or more often it encounters atom names inside a residue that do not quite match its libraries, the program will throw an error message and you will not get a system ready for simulations until that's fixed. The coordinates that come out of LEaP reflect the structure it was given, after filling out any incomplete residues or constructing what it was told to make. The topology that comes out of LEaP is a complete description of how that system will behave. The simulation is needed because the system is almost certainly so complex that analytic solutions are not to be found. "Standard" residues: AMBER has library files for standard amino acids, nucleic acids, lipids, and sugars. These libraries are designed to work with established parameter sets, as defined in their respective leaprc files. In Amber16 and later versions, we have defined leaprc files for different descriptions of proteins, nucleic acids, and solvents (including a number of water models), so that you can mix and match as you need. You include these leaprc files in your LEaP input by simply stating "source leaprc.protein.ff14SB" and so forth; can't find the files? That's because they're stashed away in $AMBERHOME/dat/leap/cmd/, but LEaP knows where to look in order to find the standard includables much like the C compiler gets run with a default directory for its standard libraries. Bear in mind that not all combinations of the models we provide are recommended, but also that we went to the trouble of making these files because we think that individually they are good options. Non-standard residues: Library files may exist for nonstandard residues (for instance, you may find them on the web), but you should always check their contents and the means by which they were derived. In most cases users will simply need to created a corresponding .lib file for themselves. This process takes the antechamber program as described in a separate tutorial. The antechamber program will generate its own .frcmod files for custom-built residues, typically using the General Amber Force Field, but the exact source of parameters is subject to some user control. The .prepi files that antechamber produces easily can be read by LEaP to create library files proper, or just treated as library files themselves. In most cases antechamber will also create a .frcmod file containing custom parameters, which is also then needed by LEaP when building the system. The pdb4amber program: While we make our best effort to provide force fields that plug into the structures the PDB and other databases hold, there are multiple atom naming conventions and other aspects of structures that prevent us from being universally compatible. To mitigate this problem, we offer the pdb4amber program which modifies atom and residue names into conventions that the rest of our programs will understand. It's mostly for proteins, but it can be applied to other biomolecules. There are some limitations to the program, such as a limit of 100,000 atoms owing to the PDB CONECT format. The program will provide a list of options if run with no arguments; a typical application is shown in the example below. The AMBER Manual gives a more general description of how to add bonds, but this is the format you will encounter most often. Make sure to relabel any cysteines that need participate in disulfide bridges as CYX, not CYS as they appear in the Protein Data Bank (PDB). The specifications of each atom are not ambmask strings, and it is important to note that the residue numbers you must provide are the positions of residues that appear in the structure file, not the residue numbers that might be given in that file. This makes a difference if you have a .pdb file that starts its residue numbering at something relevant to biochemists, like CYS 14, THR 15, GLU 16, CYS 17, … In that case, a disulfide bond between the (relabeled) CYX 14 and CYX 17 of this structure (read from its parent .pdb file as MyUnit) would be specified by: bond MyUnit.1.SG MyUnit.4.SG. The leap.log file: The most important output from leap will be piped to the terminal, or whatever file you redirect it to (i.e. leap -f InputFile.txt > OutputFile.txt), but there's another source of output that will be constantly appended with verbose output from every LEaP session run in the directory: leap.log. Clear this file before running LEaP if you want to focus on the details of what you are doing. Reading through leap.log, you will find every command that you placed in your input file, and much more. It will really show you how the leaprc files you reference are taken as scripts: in fact, virtually every part of their contents could be specified directly in the LEaP input file if it weren't alreayd written down for you to include. Error Messages: Even advanced AMBER users will make mistakes, but fortunately LEaP reports most issues that it encountered. The key is for all users to read the LEaP output carefully as the errors are often easily overlooked. It is far better to spend a minute checking the output only to find that nothing is wrong than to start a simulation, run it for two weeks, and then review the outcome only to find that the system had a subtle problem at the very start. This simple exercise in creating a solvated protein in water will apply the principles we have just learned. We will use the snake venom toxin fasciculin, 1FSC.pdb, the ff14SB force field to describe the protein, and the SPC/E water model. Because fasciculin contains four disulfide bridges, we must rename the CYS residues participating in such interactions (all of them, it turns out) to CYX. The CONECT records in 1FSC.pdb will take care of the bonds and CYS renaming when we apply pdb4amber. The output of that operation is here. There are two atoms, marked "UNL" in the structure file, which we will simply have to do away with--they are not part of the protein or any ligand, and are probably just a problem for the crystallographic refinement. The final .pdb file, before we apply tleap, is here. 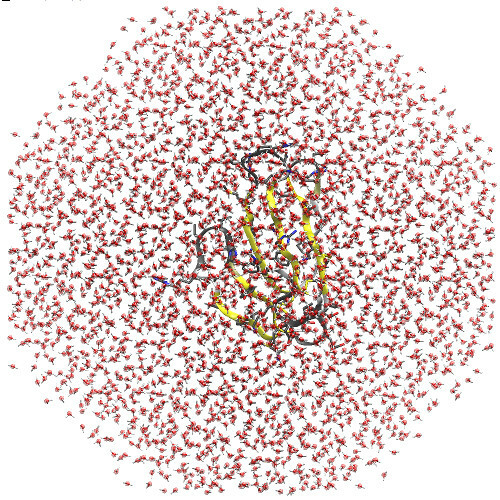 The protein and all other crystallographic waters can be seen in the figure below. In order to solvate the system, we will make use of the solvateOct command to put this thing in a regular, truncated octahedral box. This is the closest thing to a sphere that Amber has, and the most efficient way in terms of space (and thus particle count) to surround a biomolecule with water. In the early days of MD we often did "shoe boxes" with dimensions dictated by the shape and orientation of the biomolecule. The trouble with this approach comes when simulating something that can tumble, and the timescales our simulations routinely reach nowadays will pretty much guarantee that will happen. In our simulation there will be periodic images of the protein arrayed in an egg-crate layout (that's how the truncated octahedron stacks), and we do not want a situation where the thing could touch an image of itself. The settings below would be pretty good for running a simulation with a 9 or 10Å cutoff; a buffer of 14Å is used, but the water in that buffer region is going to settle somewhat around the protein so the box volume will shrink a bit in the first 100-200ps of dynamics after a barostat comes into play. There is a tutorial about using the AMBER force field in CHARMM. In this way users can take advantage of the functions provided by the CHARMM software package. Interested users can check this link.